WHEN my uncle Gorio, my mother’s elder brother was a young man many, many suns and moons ago, he had a girlfriend that we’re just going to name Sandy whom he wanted to marry but who broke up with him instead. My uncle was broken-hearted and tried to give her some space at first, hoping that she just needed it but the weeks passed and she became cold and aloof until she would barely talk to my Uncle. My Uncle, who told this story to us one rainy night during a power outage when we were kids, said did not give up easily though. He was always there and tried his best to win Sandy back. One day, Sandy got sick from a disease that no one could determine. During those times, the barrio folk rely more on albularyos or faith healers, but when none of the rituals the albularyo performed on her worked, her family was forced to take her to the doctor. She was admitted to the hospital but none of the doctors just could tell what was wrong with her. Sandy was taken back home where she got weaker each day. One night, she got so worse and just stopped breathing that they all rushed to her bed calling her name. Suddenly, from under her pillow, a white envelope tumbled out. They grabbed the envelope and opened the sheet of paper inside. Sandy’s name was written on it but it was the only thing they can read in the whole page letter. 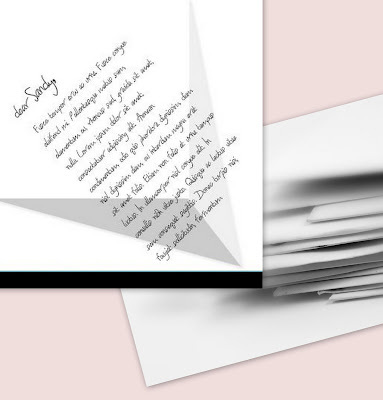 They were alarmed when a similar envelop tumbled out of her bed the next night, with the same indecipherable penmanship except for Sandy’s name. Yet another letter arrived the next night, and the next, and with each letter she grew weaker and weaker. On the seventh night since the letters started coming, Sandy just stopped breathing. The albularyo was called and started to perform more rituals at her bedside but there was no more response from her. As was the custom in those days, they buried her the following day. My Uncle Gorio was inconsolable. With the help of family and friends, he tried to move on with his life. One day a couple of months later, a woman from the same barrio who already moved to Zamboanga City, several hours bus ride away went back to the barrio for a visit. She saw my Uncle and told him that she saw Sandy in Zamboanga City with a man who looked like a foreigner. She told my Uncle that she slapped Sandy in the arm but acted like she did not recognize her. When she chased Sandy, the later told her they were in a hurry and had to go. She also noticed that Sandy avoided looking into her eyes. The two girls grew up together, and if there was one person outside Sandy’s family who knew her so well, it was that woman. My Uncle said his jaw dropped, while everyone’s eyes went round as saucers. Total silence engulfed the gathering of barrio folks who were there. That woman did not know that Sandy was already dead, and when they told her, it was her turn. Her jaw just did not drop, she collapsed. The albularyo explained that there have been already so many instances when people die but they were actually claimed and taken to the other world.